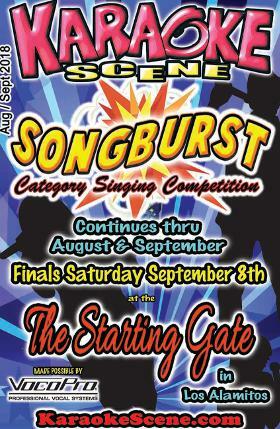 The SongBurst Category Singing Competition continues throughout the month of August, and is it ever exciting! People are loving this new format and, best of all, there is still plenty of time to enter. This is proving to be one of the most fun and popular contests ever, so please don’t miss it. Please see pages 6 and 7 of this issue for more details and the remaining qualifying and semi-final rounds. Check in time for Finalists is from noon to 1:30pm sharp. Please, Finalists must be on time to avoid disqualification. The Finals Competition will begin at 2pm. SongBurst would not be possible without the generous support of our major sponsor, VocoPro Professional Vocal Systems. We sincerely appreciate their support in making SongBurst happen this year. We strongly encourage you to show your appreciation to this fine company and their excellent products. Please don’t forget to check out the KJ of the Year Award nominees listed on page 4. These are extremely talented individuals that have been voted the best by the Southern California Karaoke community at large. The winners will be announced and the awards presented at the SongBurst Finals at the Starting Gate on Saturday, September 8th by radio and television personality, KJ, and now very successful author, Manny Pacheco. Each of these nominees is already a winner just by having been selected as a nominee from the huge number of KJs in Southern California. It is very important that the nominees be present at the event to receive their awards. Please plan to be on hand to show your support for these talented people who make such a positive impact on your Karaoke experience. See you all at the SongBurst finals!